Jonah Bossewitch works as a Technology Architect at the Columbia Center for New Media Teaching and Learning. He is also pursuing a graduate degree in Communication and Education at Teachers College. Jonah has close to a decade of experience as a professional software architect, designer, and developer. He is an active open source contributer whose technical interests include Linux, Python, Content Management and Social Software. He graduated from Princeton University ('97) with a BA in Philosophy, and certificates in Computer Science and Cognitive Studies. A presentation from the forthcoming anthology on wikis and education - The Wild, Wild Wiki: Unsettling the Frontiers of Cyberspace. 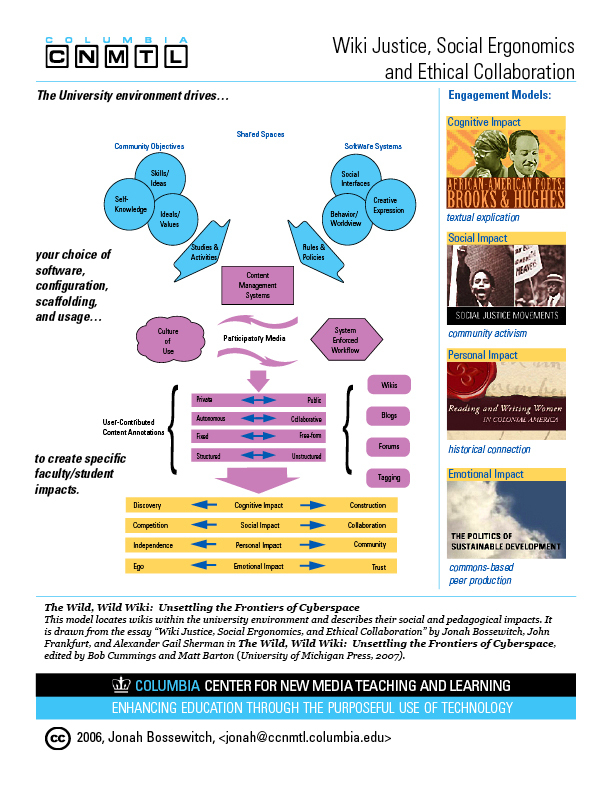 This poster is drawn from the essay entitled 'Wiki Justice, Social Ergonomics, and Ethical Collaboration' and introduces a model which locates wikis within the university's pedagogy-technology context and describes their social and pedagogical impacts. This page was last edited on 1 August 2006, at 15:26.